Volunteering for LOWA is an experience like no other at the lake. 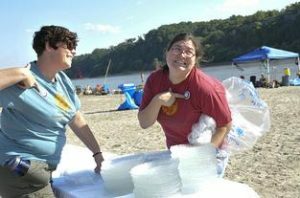 Volunteers are the backbone of LOWA and often enjoy front row seats to some of the lakes best and most popular events including the Lake of the Ozarks Shoot-out, the Annual Off Shore Series, and of course LOWA’s own 2 Dam Days Paddle. LOWA volunteers come from all walks of ages and range in all ages. A LOWA volunteer gains solid skills development in caring and protecting for our watershed, adds to their resume in-field career experience that often lead to new and interesting professional paths, the satisfaction that comes from knowing their value and personal growth, a wealth of social interaction with other volunteers, professionals and like minded people looking to improve their watershed, and last but not least the knowledge they are making a difference! A great place to begin your search for LOWA volunteer opportunities is to check out our upcoming events.